Gout in the hand may affect any joint by forming crystals of uric acid in the tendons, cartilage and bone. These crystals may cause severe pain, swelling, and redness. 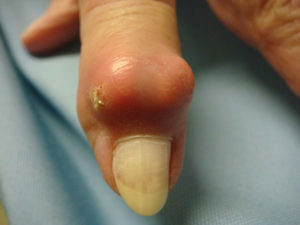 Eventually, the joint may become stiff and so swollen with uric acid that deformities may occur in the nail, tendons may rupture and the skin may break down. The entrance of bacteria through breaks in the skin may result in secondary bacterial infections of the joint structures. This may develop into chronic osteomyelitis with bone destruction. At this stage secondary finger deformities and loss of function may occur. Eventually amputation may result if left untreated. The condition known as pseudogout occurs when salt crystals (calcium pyrophosphate) build up in the joints, causing pain and arthritis. Symptoms include acute swelling, redness, and pain. Chronic arthritis, joint pain, and swelling often occur. Patients experiencing these symptoms should seek medical attention, since pseudogout can cause irreversible joint damage if left untreated. Diagnosis of pseudogout involves physical examination and x-rays to verify the buildup of calcium pyrophosphate. Aspiration of the joint fluid may confirm the diagnosis if the classic crystals are seen under the microscope. Treatment may include aspiration, steroid injections, and/or non-steroidal anti-inflammatory medications. With proper treatment most people successfully recover from pseudogout with early reduction in pain. Read more about Gout and Pseudo-gout HERE.